It's been several years, four at least, since I've heard from Odin's Court. They've given us an all acoustic album and compilation since 2011's Human Life In Motion, my last experience with the band. 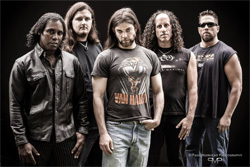 Now the band returns their latest, Turtles All The Way Down, a concept album that returns the band to it's earlier musical roots of melodic progressive rock with a touch of metal. The title needs some explanation. It refers to "infinite regress problem in cosmology posed by the "unmoved mover" paradox." In the words, who made the world or universe, and who made them, ad infinitum. The origin of the expression "Turtles all the way down" is somewhat apocryphal, supposedly coming from the idea that the world is flat and supported on the back of a turtle. When the person who posited the theory was asked, who supports the turtle, they answered with this clever anecdote: "It's turtles all the way down." We should be moving on to the music, but here's a few more observations to ponder. The title and it's explanation may remind you of Terry Pratchett in his many Discworld stories. In the Discworld universe, the earth is flat, supported by four elephants who in turn are standing upon a large turtle. Of course, our question is asked once more. Wherein we're informed, "the turtle doesn't sit on anything; it swims." Makes you wonder whether Odin's Court founder, lyricist, composer, multi-instrumentalist, and resident musical guru Matt Brookins was doing some Discworld reading. Additionally, somewhat getting to the music at hand, Turtles All the Way Down is divided into three parts: Universe, Life, and Everything. This may remind you of another playful writer within the humorous side of sci-fi and fantasy fiction, Douglas Adams and his third book in the Hitchhiker's Guide to the Galaxy series with a slightly rearranged title. By the way, the answer to the ultimate question of Life, The Universe, and Everything is 42. Once more, perhaps Brookins was contemplating traveling the galaxy with Adams. I suspect, rather, he's chuckling to himself at my rather extensive excursion into his thought process. But some words, if only brief, about the music within Turtles All the Way Down. This material is basically straightforward progressive rock touched with metal, mostly driven by Brookins melodic arrangements and centered upon the dual guitar work between he and fellow guitarist Rick Pierpoint. Like blood brothers in music, they have a similar tone and expression which makes for a seamless harmony. If you're bit of a guitar geek, as I am, you'll find the texture of the riffs and the thrill of leads quite satisfying. And these are identified in the booklet for you, a nice touch. There's some dueling going with keyboards, mostly in the final track. As for the arrangements, I would not call the compositions hyper-technical; this is not some weird math metal. But there are twists and intrigue from the usual suspects of instrumentation, tempo, and such. What I caught most of all within the songs was a true sense of groove and harmony, which gave the songs real liveliness and emotion. Conversely, I struggled more than a little with the vocals. Dimetrius LaFavors basically sings clean and melodic, but often seem muted by the production, his voice being often indistinct and unclear. Other times, as with the vocal arrangement of The Warmth of Mediocrity, you discover his natural gift for melody and harmony. All in all, Turtles All the Way Down is an exceptional album of classic melodic progressive rock and metal, perhaps even Odin's Court's best work to date. Easily recommended. 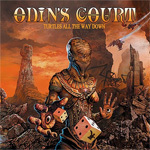 Turtles All the Way Down is an exceptional album of classic melodic progressive rock and metal, perhaps even Odin's Court's best work to date. Easily recommended.